The Route of the Franciscans. The first Franciscan monasteries appeared in the lands of Lithuania’s neighbor, Poland, shortly after the death of Francis of Assisi in 1226. These Franciscans, who were also known as the Lesser Brothers, came to Lithuania and various other countries to preach the Gospel to pagans and infidels. The first Franciscans came to Lithuania during the reign of King Mindaugas. After the Christianization of Lithuania in 1387, the first bishops of Vilnius, Andrew and Jacob, were elected from the Franciscan order. Jacob, the Bishop of Vilnius, spoke Lithuanian and during ten years of service was able to lay the foundation for the Vilnius Diocese. Unfortunately, Franciscans also became the first martyrs of Vilnius, who are commemorated by Holy Cross Church, located at S. Daukanto Sq. 1. After the Christianization of Lithuania the Franciscan order experienced rapid growth. At the beginning of the 15th century dissentions arose within the order, with some friars wanting stricter adherence to St. Francis Rule. As a result, the order split into “Observant” and “Conventual” branches. Most of the old monasteries in Lithuania remained occupied by the Conventual Franciscans, who adhered to a less strict rule and were more sedentary than Observant Franciscans. The latter branch in Poland and Lithuania are known as Bernardines, named after St. Bernardine of Siena. Conventual Franciscan Friars, along with the Dominicans, were the first propagators of Catholicism in the Grand Duchy of Lithuania. Later, they actively fought against the Protestants, and organized public religious debates and theological conferences for the noblemen and residents of Vilnius. During the 18th and 19th centuries, they preached sermons in various languages, and were known for propagating devotion to the Immaculate Conception of the Blessed Virgin Mary. The monument of the Three Crosses was erected to commemorate seven Franciscan martyrs of Vilnius, who were executed during the reign of Grand Duke Algirdas. It was built on the Crooked/Grey Hill, which is now known as the Hill of Three Crosses. 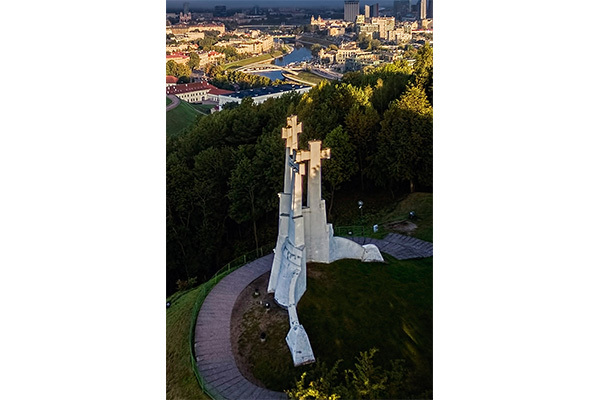 The concrete Monument of Three Crosses was designed in 1916, by the famous architect Antanas Vivulskis, who died soon after World War I defending Vilnius from the Bolsheviks. In 1950 the Soviet government destroyed the original monument, though its remnants can be seen at the foot of the hill. The present monument of the Three Crosses was reconstructed in 1989, just before the restoration of Lithuania’s independence. As one of their missions, Bernardine monks arrived in the Grand Duchy of Lithuania during the middle of the 15th century. The first wooden church was built in the 15th century by the Vilnius Bernardines – Franciscan Observant Friars, who sought to live guided by the ideal of the monastic life of St. Francis of Assisi (1182-1226). The original wooden church burned down, and its replacement constructed of brick, had to be dismantled due to structural mistakes. The current Church was built between 1506-1516, and included the presbytery with monastic choir and sacristy, which had been preserved from of the dismantled church. The Church was considered one of the largest and most beautiful buildings in the City. The Bernardine Monastery, which was built together with the Church, had a noviciate, seminary, a scriptorium and a library. Bernardines were reknowned for their ability as preachers and as tradesmen. After the uprisings of the 19th century, the Tsarist government closed the monastery. After the Second World War, the Vilnius Art Institute (now the Academy of Fine Arts) was established in this monastery. During Soviet years the Church was turned into a warehouse for the Institute of Art. Later, Franciscans re-consecrated the Church, which had been returned to them in 1994. Thirteen wooden altars of Late Baroque style were restored and survive to this day. In the naves of the Church, one can admire Gothic style crystal, cross and star vaulted ceilings. The nave walls are decorated with Gothic polychrome frescoes, consisting of colorful compositions of figures from the Bible, life of St. Francis of Assisi and hagiographic themes. These frescoes were created in the 16th century and are considered unique. The oldest known sculpture of the Crucified Jesus in Lithuania dating to the 15th century, can be seen in this Church. Today it is located in the right nave Chapel of St. Florian (Three Kings). Bernardine devotion for the suffering of Christ is also evident in the churchyard Calvary construction, which began in the 17th century. Later, the Way of the Cross was erected in the chapel near the Church. Only one station called Scala Sancta, has survived from the old Calvary to this day. In it, there is a replica of the Holy Steps, which St. Helena brought from Jerusalem to Rome. The chapel is accesible through the Neo-Gothic belfry built in 1874. The image of Our Lady of Sorrows was painted in 1699, when the rights to hold an Indulgence Feast of the same name were granted. The painting, with metal coverings, is hung at the altar of “Sokala” or Russian Mother of God, which is located on the left side of the central altar. This image is one of the most renowned Marian images, which is famed for its graces, and which is related to the Lithuanian and Polish Bernardines.